Branch Meeting Dates: 2nd Wednesday of Every Month, Noon-1:00 p.m. Meetings for Fall, 2nd Wednesday noon to 1pm, DeSantis 5145. Equal Pay Day is a public awareness event to show the gap in women’s and men’s wages. 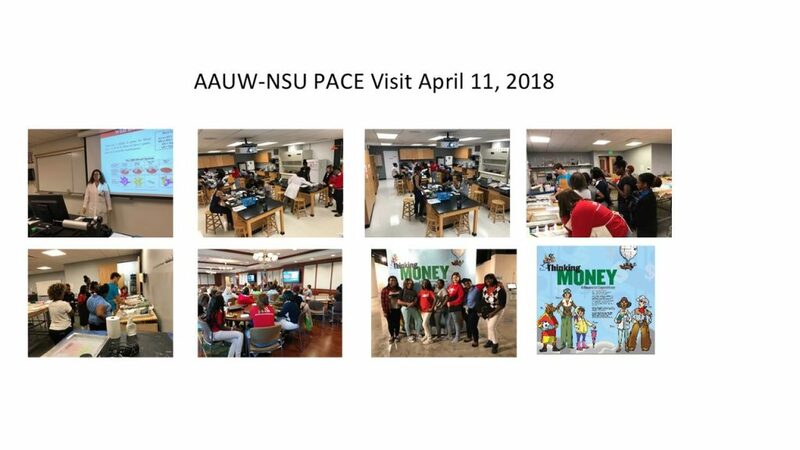 This year this NSU chapter of the AAUW, demonstrated this discrepancy between wages on Thursday, April 4, 2019 from 12:00 p.m. – 1:00 p.m. in the University Center. 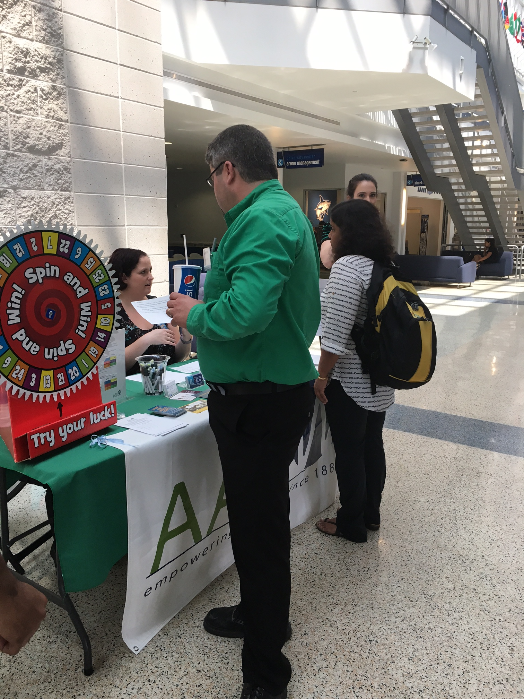 Students, faculty, and staff were encouraged to see what this means by spinning the wheel. Depending on the color they land on, they receive a ‘salary offer’ to match that color block. If they are lucky, they land on orange, the salary corresponding to a white male. If not, their salary offer is reduced to match the color block (divided by race and gender). The purpose is that the spin of the wheel is not a reflection of their credentials or how hard they will work. It is NOT earned. Just like race and gender are not earned, they just are. Participants were also given handouts with salary negotiation tips and information about our own salary negotiation workshop. Many students seemed surprised with the information they received. Hopefully students, faculty, and staff will take this opportunity to learn even more at the salary negotiation workshop on Wednesday, April 24th from 12:00 p.m.- 1:00 p.m. in the Carl DeSantis building Room 1046. 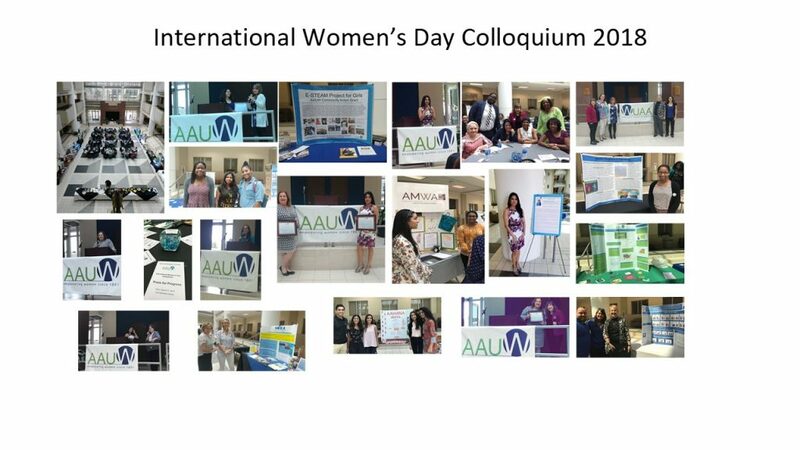 On Wednesday, March 20th NSU’s American Association of University Women (AAUW) sponsored the 14th annual International Women’s Day Colloquium in the Carl DeSantis Atrium. 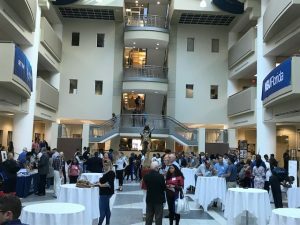 The theme for 2019 was Balance for Better and nearly 100 students, faculty and staff attended this event. 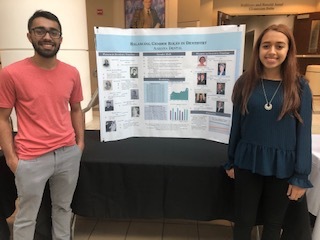 Student organizations participated by displaying their research posters that focused on gender equity issues in their chosen fields. Dr. Randi Sims, President NSU-AAUW, welcomed all in attendance and discussed the history of the women’s movement and posed the question of what this generation will do for future generations of young girls and women. Dr. Maureen McDermott, Vice-President of Membership NSU-AAUW, then introduced the eloquent speaker. Ivelices Thomas, Founder and Chief Executive Officer of RH & Beyond gave a poignant and heartfelt speech on Creating Your Own Path to Parity. Ms. Thomas discussed her personal journey and the challenges and obstacles that she discovered along the way. She learned invaluable lessons such as being an advocate for yourself by demonstrating you are the right person for the role. Additionally, all women need internal advocates for times when you aren’t in the room to represent yourself. She emphasized forming relationships with colleagues at all levels of a business. She also recommended becoming involved in organizations that matter to you and your company. Women helping other women was also stressed. She shared her personal experience of getting to a top position and hiring many women. At first she worried about doing this but then realized this is how the positive change happens. Afterward undergraduate student Sarah Goltsman, winner of the USS-AAUW award, shared her powerful spoken word poem Masterpiece. This thought-provoking poem incorporated women’s right and suffrage as well as sexual harassment and abuse. The main theme is that a woman’s body can stop being her own. Throughout her art, she invokes other women she admires in her life showing women are so much more than their bodies. Her poem can send chills through one’s body as it was so real and relatable. It ended with hope that through open discussion and unity a difference can and will be made. This event concluded by closing commentary from Rose Llanos-Almeida, Director of Programs NSU-AAUW, where she invited everyone to become part of the AAUW and push forward on our path together. AAUW-NSU wishes to thank the Office of Orientation & Commuter Engagement and The Women’s Success Series for partial funding of this event. It was quite an eventful day for the girls from the Pace Center for Girls. 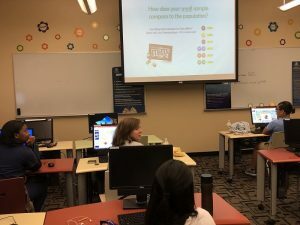 This was the final session of the “E-STEAM Project for Girls” for 2019. There were six girls that participated in this final session which was a half day filled with fun, yet educational activities, on Wednesday, February 13th. At the beginning of the day, the girls worked with Ashley Rizzotto, Career Adviser. Ashley started her lesson by introducing the girls to value cards in relation to potential careers. 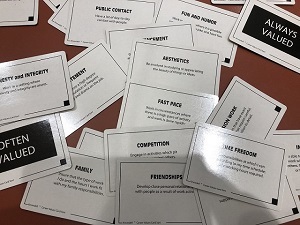 The girls sorted through these cards and selected ten, and then five cards, that best represent what they want in a career. The cards ranged from vales such as competition and fast pace to other values like honesty and integrity and helping society. It was quite the challenge to only choose five cards, but the girls managed to do it and added this information to their ongoing individual PowerPoint presentation. Ashley also discussed career mapping and websites where the girls can go to conduct their own further career exploration. After that activity, the girls headed over to the Don Taft University Center where they split into two groups. The first group worked on completing their PowerPoints. 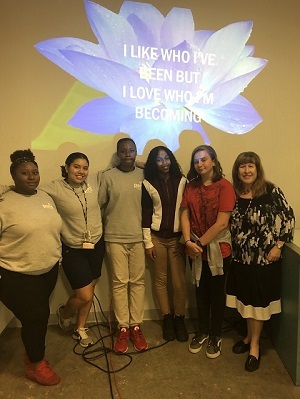 Dr. Maureen McDermott, Associate Professor for the Fischler College of Education, assisted the girls in finishing their PowerPoints making sure the slides contained a balance of type and graphics. 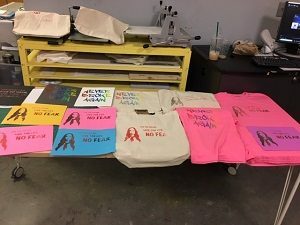 The other group worked with Kandy Lopez, Assistant Professor for the Department of Performing and Visual Arts, and her undergraduate students and created their own T-shirts and tote bags using screen printing. The girls really enjoyed making their own unique creations with a quotation and image that is important in their life. After both groups completed one activity they switched and worked on the other activity so each groups had an opportunity to work on their T-shirts as well as finish their PowerPoints. After all that work they were able to relax and eat a delightful pizza lunch. 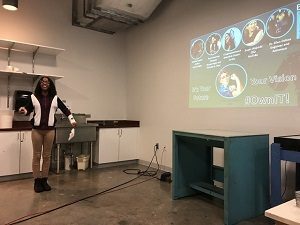 The final event was the girls presenting their PowerPoints to their peers and the members of the AAUW. Dr. McDermott gave a lesson about public speaking when using slides on a projector. The girls did a fantastic job presenting what they learned about STEAM while making eye contact with the audience. They discussed how they could implement what they learned in the program when formulating career goals as well as life goals. The event culminate with a celebratory cake, certificates, and goody bags for each girl. All of these girls accomplished so much throughout their six sessions and learned about STEAM with information and memories they will carry with them throughout their life’s journey. A special thank you to our facilitators: Dr. Julie Torruellas Garcia, Dr. Maureen McDermott, Ashley Rizzotto, and Kandy Lopez. 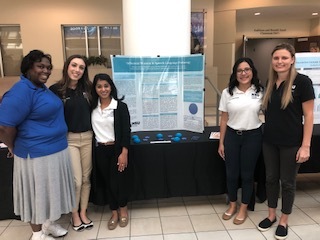 Also, thank you to our AAUW-NSU student members, as well as our AAUW-NSU faculty and staff members that assisted with this event: Dr. Randi Sims, Dr. Vanaja Nethi, Laura Macias, Kaija Ranglin & Esha Parikh. Our undergraduate art students: Paige Allen, Stephanie Suarez, Mikaela O’Donnell, Avery Hutt, and Indaya Williams were helpful volunteers as well. It was a busy day for the nine students from the Pace Center for Girls. The “E-STEAM Project for Girls” progressed with a half day filled with events and lunch on Wednesday, January 30th. In the morning the girls worked with Tennille Shuster, Associate Professor for the Department of Performing and Visual Arts. During this time, the girls created a design layout for their own shirts. They selected a quotation that inspired them and also picked an image for their shirt. Next, they went to the Conference Room in the Library where they enjoyed a delicious lunch from the West End Deli at NSU. 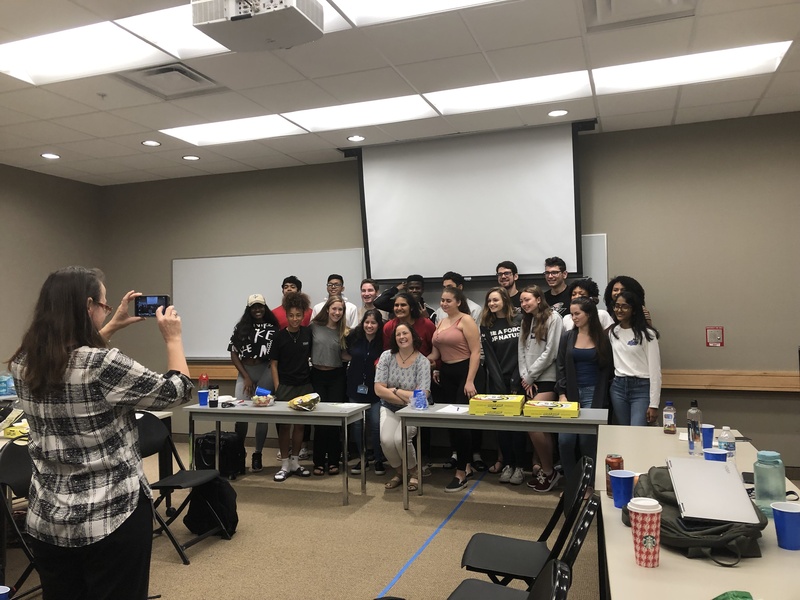 After that it was time for an engaging math activity with Randi L. Sims, professor at the Wayne H. Huizenga School of Business and Entrepreneurship. This activity taught the girls about sample size population. Each girls received an individual bag of M&Ms. Thy counted and graphed on their PowerPoints with the amount and colors of M&Ms. This data was compared to the percentage of M&M colors at the Distribution Center. The girls also made comparisons with another peer. It was a fascinating activity with hands-on learning! Afterward the girls worked on completing their PowerPoint presentation that they have been working on since the beginning of these sessions. It was quite an educational and riveting day! A special thank you to our facilitators: Dr. Julie Torruellas Garcia, Dr. Randi Sims and Tennille Shuster, M.F.A. 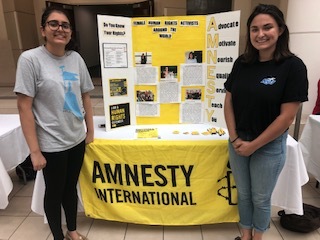 Also, thank you to our AAUW-NSU student members, as well as our AAUW-NSU faculty and staff members that assisted with this event: Dr. Maureen McDermott, Winnie Verna, Laura Macias, Kaija Ranglin & Esha Parikh. On January 16, 2019, the students from the Pace Center for Girls participated in their fourth session in the “E-STEAM Project for Girls.” This was a particularly exciting session as the girls visited the Marine Environmental Education Center (MEEC) and the NSU Oceanographic Campus. 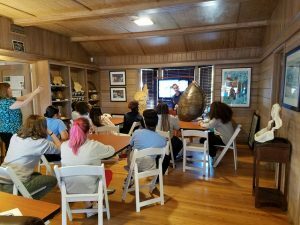 In the morning, they met with Meghan McGlone, MEEC Program Coordinator, who taught the girls about the sea turtle’s nesting behaviors, how to recognize their tracking patterns in the sand, and how the hatchlings find the ocean. 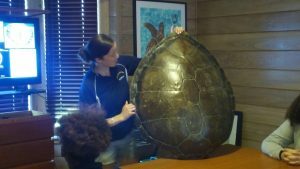 The girls enjoyed a hands-on activity with a large shiny shell from a giant turtle. 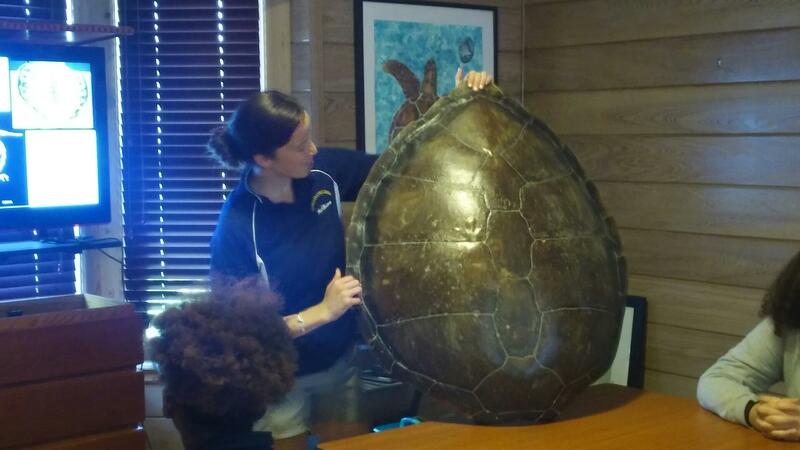 Dr. Maureen McDermott (AAUW/FCE) took the girls downstairs to the pool to see a presentation with MEEC’s permanent resident Captain, a green sea turtle who dives with the assistance of weight therapy. 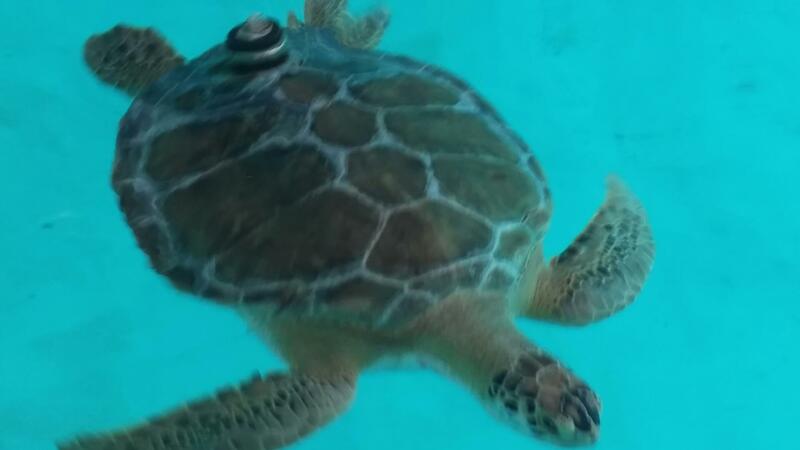 Captain captivated everyone by eating a lettuce lunch, first above the water and then swimming down to eat lettuce leaves anchored in a device on the pool’s floor. 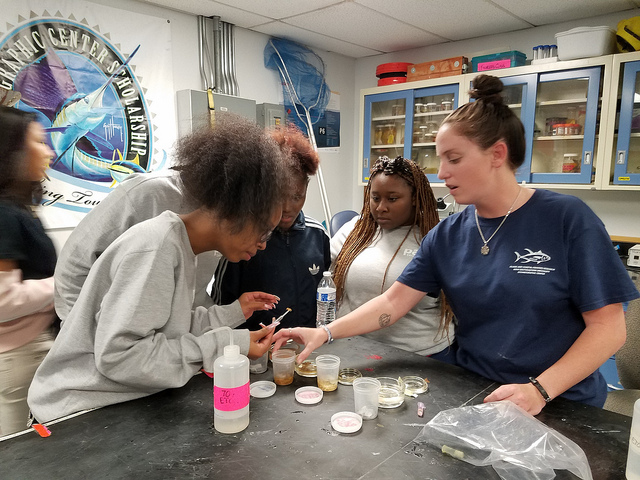 After visiting the MEEC, AAUW member and Halmos College Director of Academic Support and Administration, Dr. Melissa Dore gave them a tour around the Oceanographic Campus, where they examined a manatee’s skeleton and toured a lab with a non-living coral. After visiting the outdoor coral nursery, they worked inside with MS student Dayna Hunn on sorting her small, but fascinating, crabs. It was a day they truly will never forget! The third session for the students from the Pace Center for Girls was both informative and engaging for the young women. The “E-STEAM Project for Girls” continued for a half day on Thursday, December 6th, 2018. This time there were twelve girls who participated. The first part was conducted by NSU Librarian Sarena Hicks. 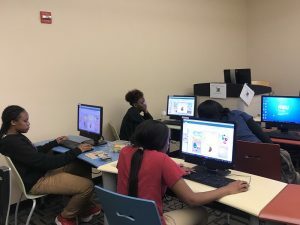 She used Kahoots!, a gamed-based platform to teach them about the library. 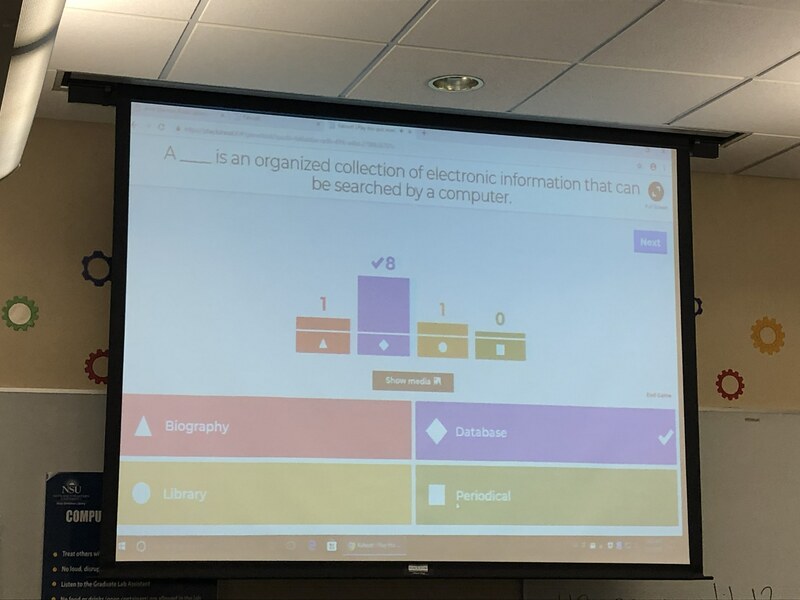 They were eager to see how they were scoring while still learning what a library database is and other library terminology. They also discovered where to go for homework help and how to explore notable women in the biographies database. All of this information was then added to their own personal PowerPoints that they are creating. 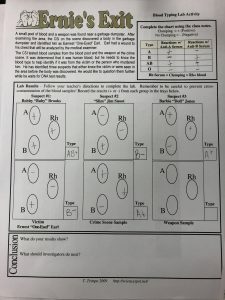 Following this, they went to the Parker Building for an intriguing Forensics Lab which was facilitated by Dr. Julie Torruellas Garcia, Associate Professor for the Department of Biological Sciences. Dr. Maria Ballester, Associate Professor for the Department and Chemistry and Physics, also assisted with the fingerprint testing. They had a mystery to solve in which they tested synthetic blood, hair follicles and fingerprinting. The girls enjoyed using the microscopes, solving the mystery, and learning about all the different career paths there are in the area of science. The final event was going to for a delicious lunch at the University Center where they conversed about their experiences throughout the day. They look forward to all that’s in store for the next session in the New Year! There is wonderful news to share with you. NSU is now an official AAUW University Partner. Therefore, students (undergraduate and graduate) are eligible for FREE AAUW membership. Staff who are also students at NSU would be eligible as well. We are looking forward to having YOU as a member! 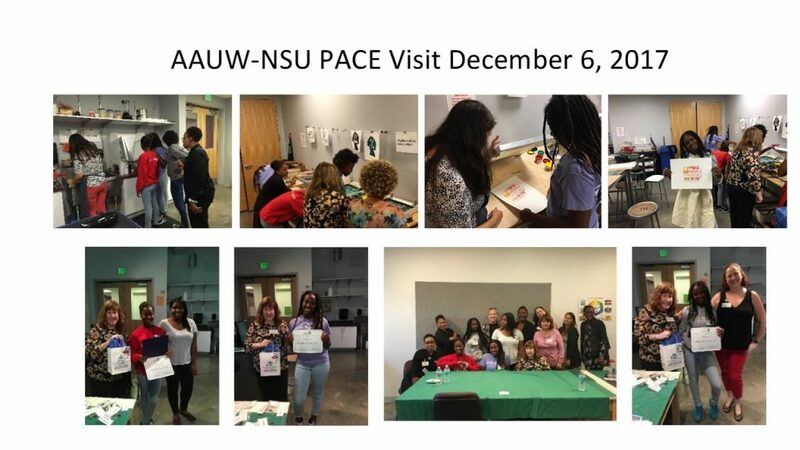 NSU’s student chapter invited board member Dr. Maureen McDermott (Fischler College of Education) to conduct a workshop in the spirit AAUW’s strategic initiative for Education and Training. Chapter President Gabrielle Orr polled the membership, which decided the topic should be time management on Oct. 5, 2018. 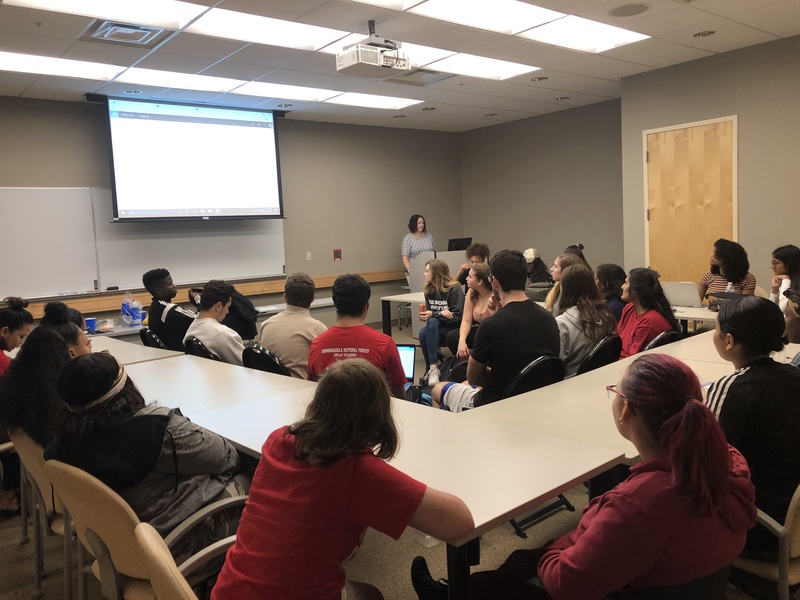 Dr. McDermott provided 10 members with their own folders that contained activities to determine how their time was really spent and then how to realign it to include more time for midterm/finals preparation. The most popular distractions reported were socializing via cell phone and watching Netflix. Students devised lists of things they should have and things they should do before the week started so there could be extra time to study alone or in groups. They also discussed the types of exams they were taking and determined the best ways to prepare for them. Winifred Verna, vice president, said she thought the workshop benefitted everyone there and thanked Dr. McDermott for her time. After midterms were over, members reported they would be using the helpful strategies again during finals in December. What an exciting and informative second session for the students from the Pace Center for Girls. The “E-STEAM Project for Girls” continued for a half day on Thursday, November 15th. There were eight girls that participated during this event. They started off the day with Mary Young talking about what goals are and each student shared their own personal goal. Then they moved into creating their individual PowerPoints after discussing what STEAM is. They used K-W-L to show what they know, want to know, and learned about STEAM. Following this activity, the girls attended a live college course UNIV 1000 with Dr. Molly Scanlon. 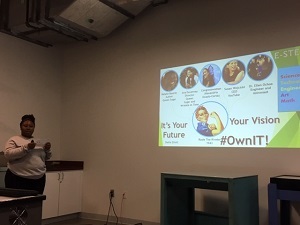 While sharing a pizza lunch together, the college students showed their own group videos they created based on a chapter from the book Always Eat Left Handed by Rohit Bhargava. The videos ranged from the do’s and don’ts of active listening to risk taking and not sweating the small stuff. 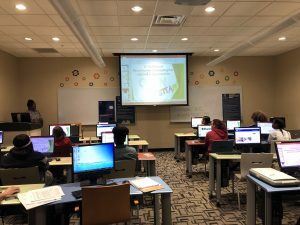 The final event was going back to the computer lab where the girls continued working with Dr. Scanlon on their PowerPoint presentations. They discussed the eight aspects of wellness and rated themselves on a scale of 0-10 for each of the categories. This then helped them figure out what their goal will be based on this information. They continued engaging in active group discussion on these interesting topics for the rest of this event. 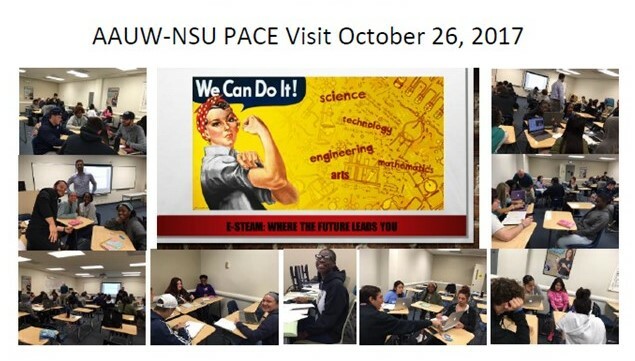 Students from the PACE Center for Girls visited NSU for their first session of the “E-STEAM Project for Girls”. This experiential learning initiative is dedicated to encouraging girls to pursue higher education and STEAM careers by way of mentorship, interactive activities, and academic success workshops. The PACE students started their day by visiting the Horvitz Welcome Center. 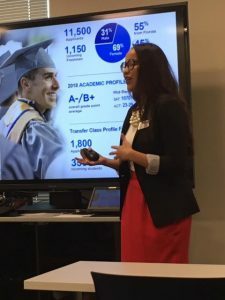 Rose Llanos-Almeida provided an admissions presentation where the girls learned about NSU’s undergraduate colleges and general admissions processes. 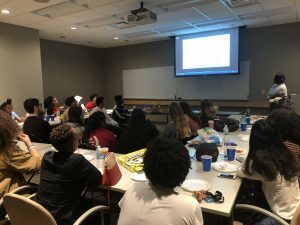 A student admissions ambassador lead a walking tour of the university and then the PACE students visited the student union for SEA Board Thursdays. Following lunch in the Flight Deck with undergraduate student mentors, they joined an honor’s class on Epidemics lead by Dr. Julie Torruellas Garcia. The PACE students joined in a lively discussion on cholera outbreaks around the world. Rose Llanos attended the mentoring conference to present our poster The E-STEAM (Exploring Science, Technology, Engineering, Arts and Math) Project for Girls Mentoring Program on October 24, 2018. Funding was provided by our E-STEAM Project for Girls 2017-2018 AAUW Community Action Grant. Llanos-Almeida, R., McDermott, M., Sims, R., Scanlon, M., Hicks, S., Ballester, M., Shuster, T., Lopez-Moreno, K., Dore, M., Anderson, R., Fabius, S., & Torruellas Garcia, J. (2018). The E-STEAM (Exploring Science, Technology, Engineering, Arts and Math) Project for Girls Mentoring Program. 11th annual mentoring conference proceedings: Mentoring, coaching, and leadership for innovation and entrepreneurship (11th ed. ): [Special Issue 11]. The Chronicle of Mentoring and Coaching, 1(11). 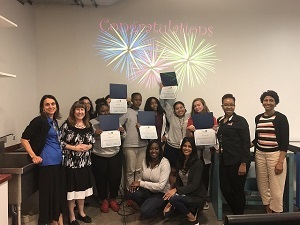 The Nova Southeastern University Branch of the American Association of University Women (NSU AAUW) developed the E-STEAM Project for Girls – an initiative to attract at risk 12-17-year-old girls to STEAM careers (Science, Technology, Engineering, Arts & Math). 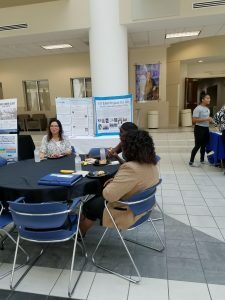 Through a partnership between NSU AAUW and the Alvin Sherman Library, the university’s joint use community library, participants have had the unique experience of working with a diverse population of University faculty, staff and college-aged mentors while engaging in innovative, STEAM-related learning experiences at Nova Southeastern University. The program includes four, half-day field trips to NSU’s campus per semester to tour the campus, attend college classes and participate in interactive activities related to STEAM. Participants reflected on their experience by giving a presentation at the end of the program. 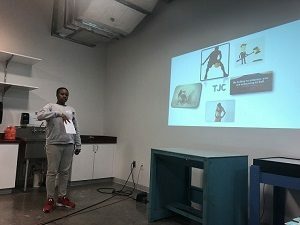 To measure the impact of the program, the mentees completed pre- and post-surveys to evaluate their likelihood of going to college and pursuing a STEAM career. The results indicated that at the completion of the program, students developed a better sense of their interests and disinterests in STEAM fields. Overall, the program has been a success and can serve as a model for other institutions. 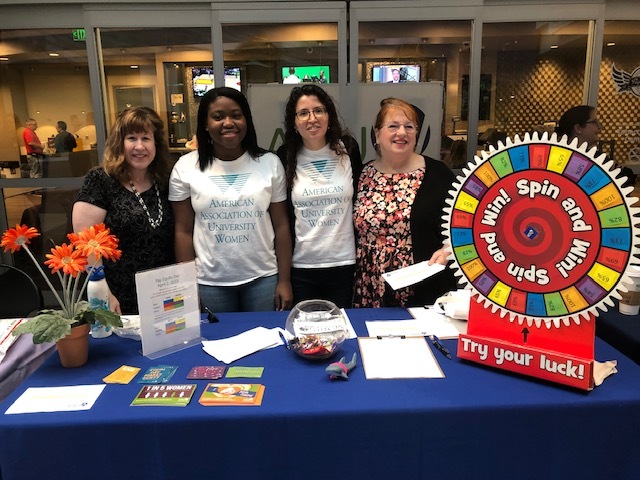 We made great strides at the Employee Health and Wellness Fair. Missy and Maureen did an exceptional job at our table. 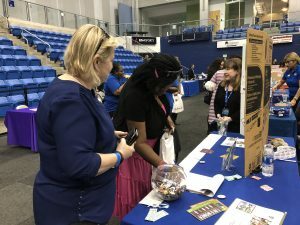 They introduced NSU employees to our professional organization, discussed important issues such as gender inequality in the workplace, and talked about upcoming events while distributing brochures and pamphlets. Many participants at this event expressed interest in learning more and voiced their approval for equal pay for equal work. Sixty email addresses were provided so these employees could be on the email list for the AAUW chapter at NSU. We are likely to have increased membership after this engaging annual event. We set our first meeting of the academic year as a membership social. We displayed information about membership, our E-STEAM program and conference paper, March 2018 International Women’s Day Colloquium, and Pay Equity Day from August 2018. 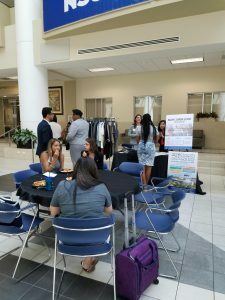 The student chapter hosted a table and Razor’s Career Closet accepted clothing donations. 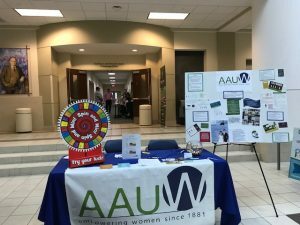 On August 23, 2018 AAUW-NSU hosted a table at the Huizenga College Passport to Success welcoming event. It was perfect timing as August is Black Women Pay Equity Day. We discussed pay inequity for women and minorities and distributed tips for salary negotiation. 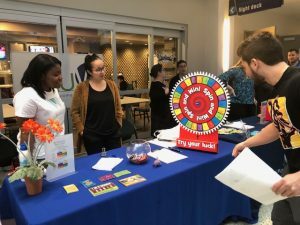 Over fifty students, staff, and faculty spun the pay inequity wheel and most were quite disappointed in the inequity of a poor spin. Contact information was collected for those interested in learning more about AAUW-NSU. 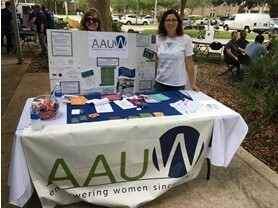 The Nova Southeastern University branch of the American Association of University Women (AAUW-NSU) has been active on campus since 2008. Fall 2018, NSU welcomed AAUW Fellowship Recipient Sharon Lelega from Sudan into the conflict analysis and resolution doctoral program. Sharon intends to focus on women’s participation in the peace process. This will be achieved by conducting a series of consultative meetings with various stakeholders in order to understand the policies related to women’s empowerment and their participation in the peace process. AAUW fellowship funding helps women manage the growing burden of student debt, an issue that disproportionately affects women. 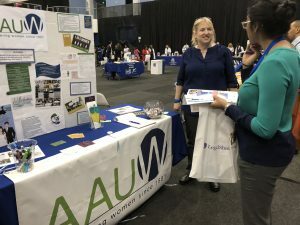 Unique to AAUW’s program, funding may also be used to pay for expenses outside of those traditionally associated with academic study, including childcare and transportation — necessities that can help recipients’ continue, return to, and successfully complete graduate programs. 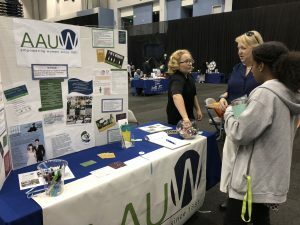 AAUW prides itself on providing fellowships and grants for women returning to either extend or complete their academic goals. 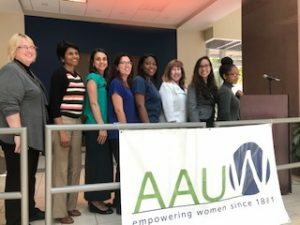 The Nova Southeastern University branch of the American Association of University Women (AAUW) is the recipient of a 2017-18 AAUW Community Action Grant. The grant, spearheaded by AAUW-NSU members Julie Torruellas Garcia, Ph.D., Associate Professor at the Halmos College of Natural Science and Oceanography and Sheila Fabius, M.P.A., Director of Undergraduate Student Success at the College of Undergraduate Studies, is a prestigious and highly competitive award, which funds innovative programs that promote education and equality for women and girls. 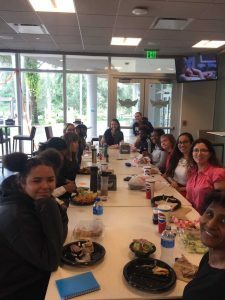 The program targeted by the grant is the PACE Center for Girls, a delinquency prevention/intervention program for young and adolescent girls in Broward County, Florida. NSU’s AAUW student and professional chapters both engage in activities that include campus visits, class visitation, science demonstrations, art projects, and a tour of NSU’s Guy Harvey Oceanographic Center. 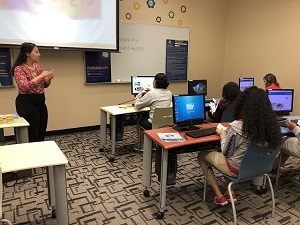 Students from the PACE Center for Girls visited NSU for their third session of the “E-STEAM Project for Girls”. This experiential learning initiative is dedicated to encouraging girls to pursue higher education and STEAM careers by way of mentorship, interactive activities, and academic success workshops. 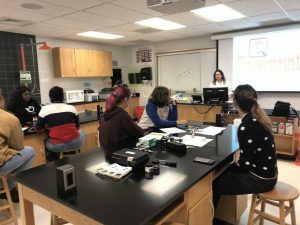 The girls started their day by attending a forensics lab with Dr. Julie Garcia and Dr. Maria Ballester where they learned how to analyze blood, hair samples, and fingerprints. Students then moved to the art lab where Dr. Tennille Shuster introduced each step in the silk screening process. In a hands-on activity, students completed the silk screening process on t-shirts, paper, and book bags. 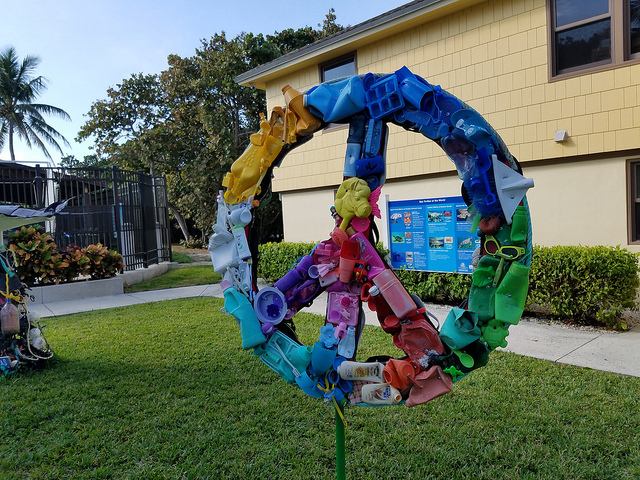 During lunch, students joined the Green Sharks for a Sustainability 101 presentation by Caiti Pomerance from Debris Free Oceans. After lunch, students visited the interactive traveling exhibition Thinking Money: A Financial Expedition in the Alvin Sherman Library. “Through an adventure-themed storyline, interactive iPad content and other fun activities, Thinking Money explores themes like wants vs. needs, preparing for a rainy/sunny day, imagining your future self and avoiding financial fraud.” Director of Library Services Nora Quinlan lead the tour and answered dozens of questions. Undergraduate student members of AAUW provided mentorship throughout the day. 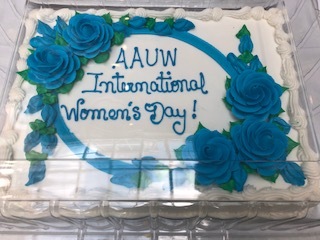 The NSU Branch of the American Association of University Women (AAUW) sponsored a lunch-time International Women’s Day Colloquium on Wednesday, March 21, 2018 in the Carl DeSantis Atrium. 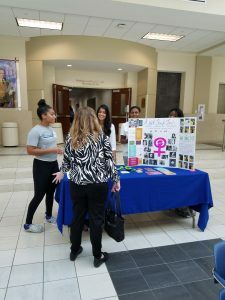 International Women’s Day 2018 was themed Press for Progress and nearly 80 students, staff, faculty, and administration attended this event. 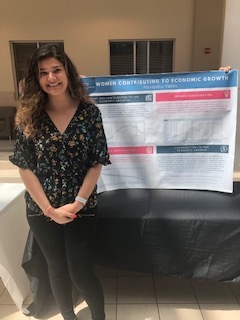 Student organizations from across campus displayed their research posters to highlight awareness of gender equity issues in their respective fields. Two distinguished speakers gave brief remarks in support of IWD. Ms. Linda Buccilli, CLTC, Financial Advisor at Northwestern Mutual and Founding Member of the HCBE Women’s Success Series. Ms. Buccilli spoke about the importance of doing your best, staying the course, being fully present each day, and always maintaining integrity and honesty in personal and business relationships. She emphasized her care in being a good role model, especially with her children. Her work life has been focused on competing successfully among financial entities and adherence to strict ethical standards. The second speaker, Dr. Farzanna Haffizulla, is the Assistant Dean for Community and Global Health at the NSU Kiran C. Patel College of Allopathic Medicine, and a globally-recognized health awareness advocate. She spoke about the need to create and preserve balance among competing responsibilities and interests in one’s life and health. Her leadership style is optimistic, dynamic and emphasizes forward progress; it is grounded in concern for gender equity but envisions uplift to family and promotes strong, caring relationships among all. Both speakers received certificates in gratitude of their participation and remained behind to speak with attendees and answer questions. 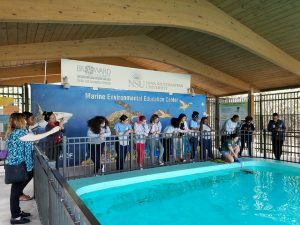 Students from the PACE Center for Girls visited NSU for their second session of the “E-STEAM Project for Girls”. 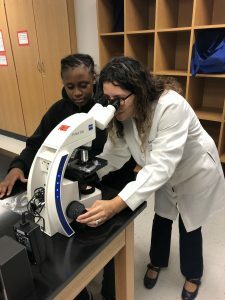 This experiential learning initiative is dedicated to encouraging girls to pursue higher education and STEAM careers by way of mentorship, interactive activities, and academic success workshops. The girls started their day with a library scavenger hunt, learning about the resources of the Alvin Sherman Library. Librarian Sarena Hicks followed up with a session on the use of the library. Next the girls joined Dr. Tennille Shuster’s Graphic Design class. Undergraduate students in the class paired with the Pace girls to help them create personalized artwork which the girls will include in their PowerPoint files. After lunch in the UC with undergraduate students, faculty member Steven Kramer, Ph.D. led a session on A Colorful Look at Sampling where the PACE students learned about sampling using mini bags of M&M candies. Using an Excel spreadsheet and formulas, they entered their findings into their Power Point files. 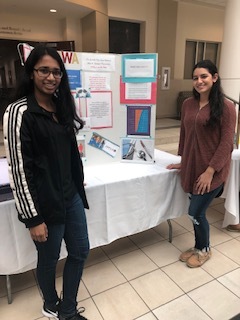 Undergraduate student members of AAUW provided mentorship throughout the day. 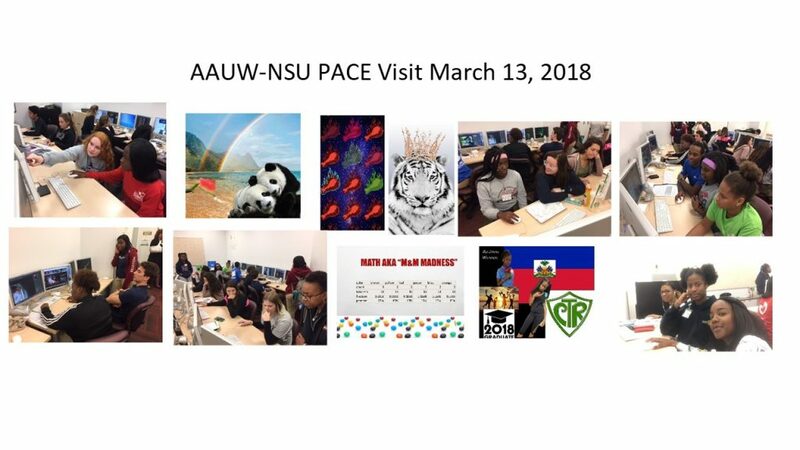 The Nova Southeastern University branch of the American Association of University Women (AAUW-NSU) has been collaborating with the Alvin Sherman Library and Broward’s PACE Center for Girls since 2008. Funding has been provided by a 2017-18 AAUW Community Action Grant. This is a prestigious and highly competitive award, which funds innovative programs that promote education and equality for women and girls. Undergraduate student members of AAUW lead icebreakers, a tour of the campus, and provided mentorship throughout the day. 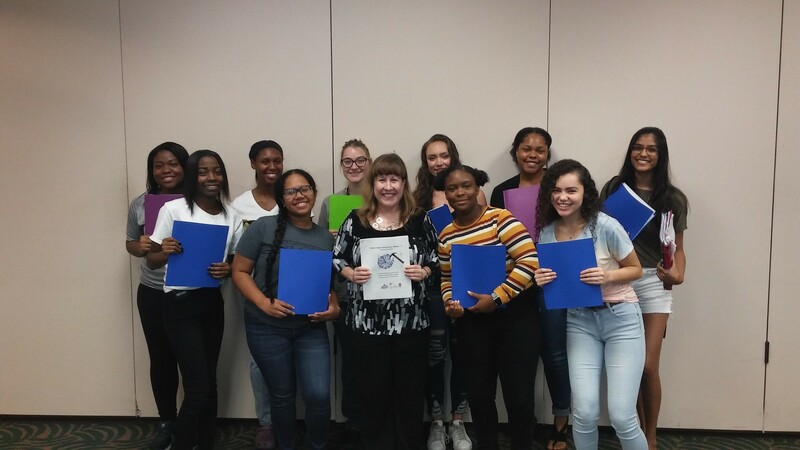 A goal setting workshop was led by AAUW-NSU faculty member Maureen McDermott, Ed.D. The PACE students personalized their journals and added reflections of the experiences from their day at NSU. After lunch in the UC, OIIT Instructional Designers Kerrian Gordon, M.S. and Mary Young, B.A. led a workshop on Power Point. Each student was provided a thumb drive and a Power Point template and learned how to personalize the reporting of their E-STEAM experiences. Students from the PACE Center for Girls visited NSU for their fourth and final session of the “E-STEAM Project for Girls”. This experiential learning initiative is dedicated to encouraging girls to pursue higher education and STEAM careers by way of mentorship, interactive activities, and academic success workshops. The PACE students started their day with Drs. Tennille Shuster and Kandy Lopez who introduced design software used for graphic art and silkscreen printing. Students were able to create their own designs and print them on paper. The class then moved to the art lab where each step in the silk screening process was demonstrated. 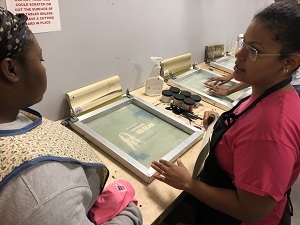 In a hands-on activity, students completed the silk screening process on t-shirts, paper, and book bags. 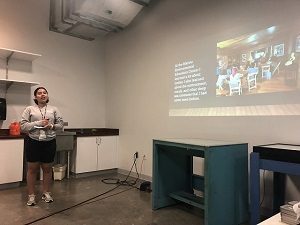 Lunch included PowerPoint presentations by each student who shared with the audience what they learned while attending the E-STEAM Project. 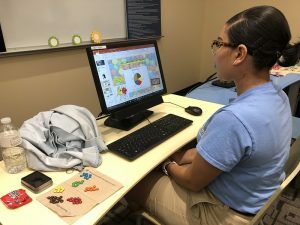 Of the twelve PACE students enrolled for Fall 2017, ten successfully completed at least two of the four sessions and were awarded certificates of completion. 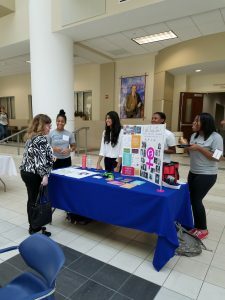 NSU-AAUW undergraduate student members provided mentorship throughout the day. 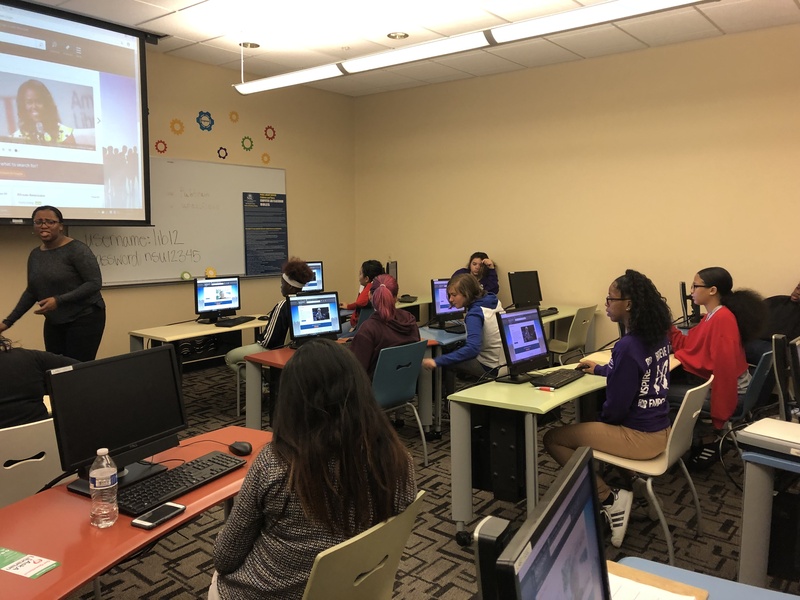 Ten students from the PACE Center for Girls visited NSU for their third session of the “E-STEAM (Exploring – Science, Technology, Engineering, Art & Math) Project for Girls”. This experiential learning initiative is dedicated to encouraging girls to pursue higher education and STEAM careers by way of mentorship, interactive activities, and academic success workshops. The PACE students started their day with an introduction to library resources presented by Librarian Sarena Hicks. Some of the students submitted their completed library card application and went home with new library cards. Next the students attended a forensics lab with Drs. Julie Garcia and Maria Ballester where they learned how to analyze blood, hair samples, and fingerprints. During lunch, a special guest speaker, Banana Wave founder Neter Alkebulan shared his entrepreneurial success story and answered questions from the students. After lunch, OIIT Instructional Designers Kerrian Gordon, M.S. and Mary Young, B.A. continued their workshop on Power Point. 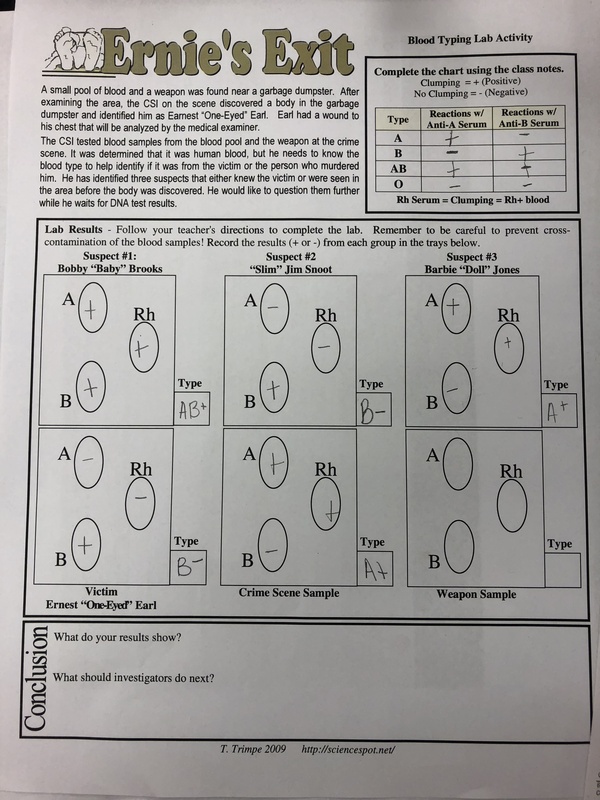 Each student was provided a thumb drive and a Power Point template and learned how to personalize the reporting of their E-STEAM experiences. 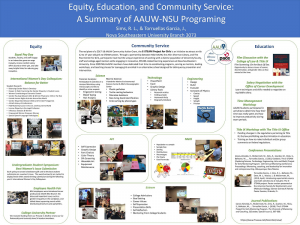 NSU-AAUW undergraduate student members provided mentorship throughout the day. 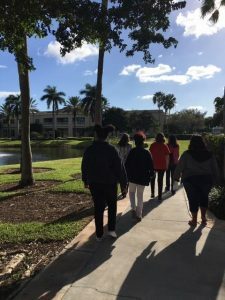 Eleven students fro m the PACE Center for Girls visited NSU for their second session of the “E-STEAM (Exploring – Science, Technology, Engineering, Art & Math) Project for Girls”. This experiential learning initiative is dedicated to encouraging girls to pursue higher education and STEAM careers by way of mentorship, interactive activities, and academic success workshops. The PACE students started their day by attending an Introduction to Athletic Training course taught by Associate Professor Pradeep Vanguri, Ph.D., ATC. 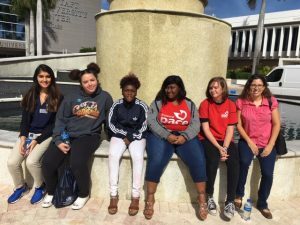 During the class, the PACE students joined discussion groups with NSU students to create an educational pamphlet about HIV and Hepatitis. Faculty members Molly Scanlon, Ph.D. and Maureen McDermott, Ed.D., continued their workshop in which the students formulated short term and long term goals for academics, career exploration, and health/wellness in their personalized journals. After lunch, OIIT Instructional Designers Kerrian Gordon, M.S. and Mary Young, B.A. led a workshop on Power Point. Each student was provided a thumb drive and a Power Point template and learned how to personalize the reporting of their E-STEAM experiences. NSU-AAUW undergraduate student members provided mentorship throughout the day. 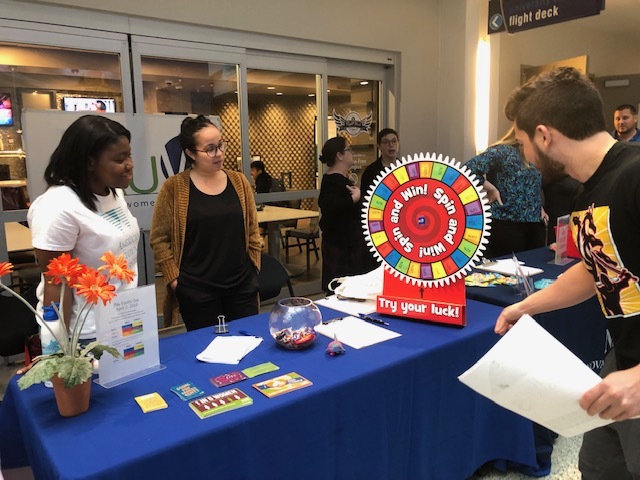 Our tabeling event at the Employee Health and Wellness Fair was a huge success. Thanks to Brooke and Missy for staffing our table. We distributed membership information, shared Halloween safety tips for women, and discussed our work with the PACE students and the upcoming Latina Equity Pay Day. We collected over 60 email addresses from those interested in learning more about our AAUW-NSU chapter. On September 28th, 2017 eight students from the PACE Center for Girls started their “E-STEAM (Exploring – Science, Technology, Engineering, Art & Math) Project for Girls”. 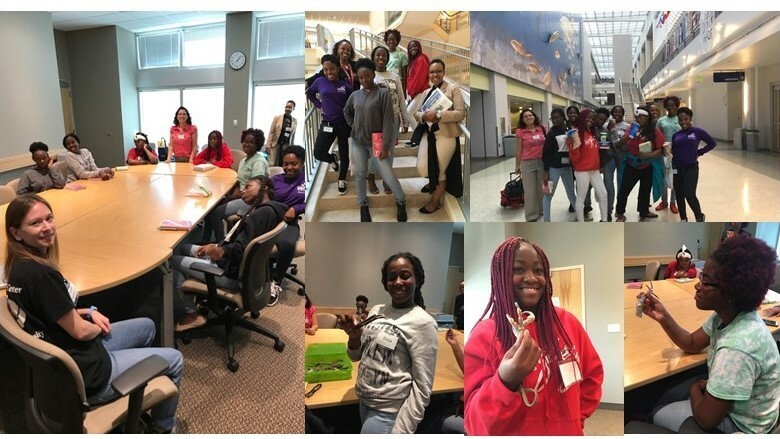 This experiential learning initiative is dedicated to encouraging girls to pursue higher education and STEAM careers by way of mentorship, interactive activities, and academic success workshops. The theme for the first visit was “Make today the day to learn something new”. 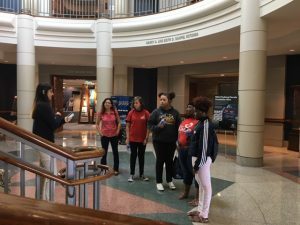 Undergraduate student members of AAUW lead icebreakers and a tour of the campus. Halmos College M.S. in Marine Science graduate student Sarah Gumbleton presented a hands on activity about sea birds. Handling the bird bones and claws was both fun and a good learning activity. A goal setting workshop was led by AAUW-NSU faculty members Molly Scanlon, Ph.D. and Maureen McDermott, Ed.D. The PACE students created vision boards on the covers of their journals and added reflections of the experiences from their day at NSU. April 4 is the day in 2017 that symbolizes how long into the new year the average American Woman must work to earn the salary not received in 2016 because of unequal wages. The NSU Branch of the American Association of University Women will be tabling in the University Center for Equal Pay Day, Tuesday, April 4, 2017, 11:30am to 1:30pm. 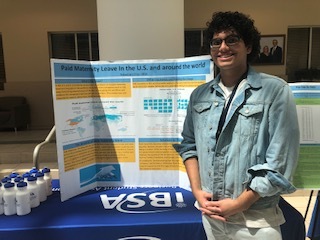 During this event, students will engage in an interactive display of wage inequity, receive random salary offers based on statistical estimates, and take away helpful hints for reducing pay inequities. 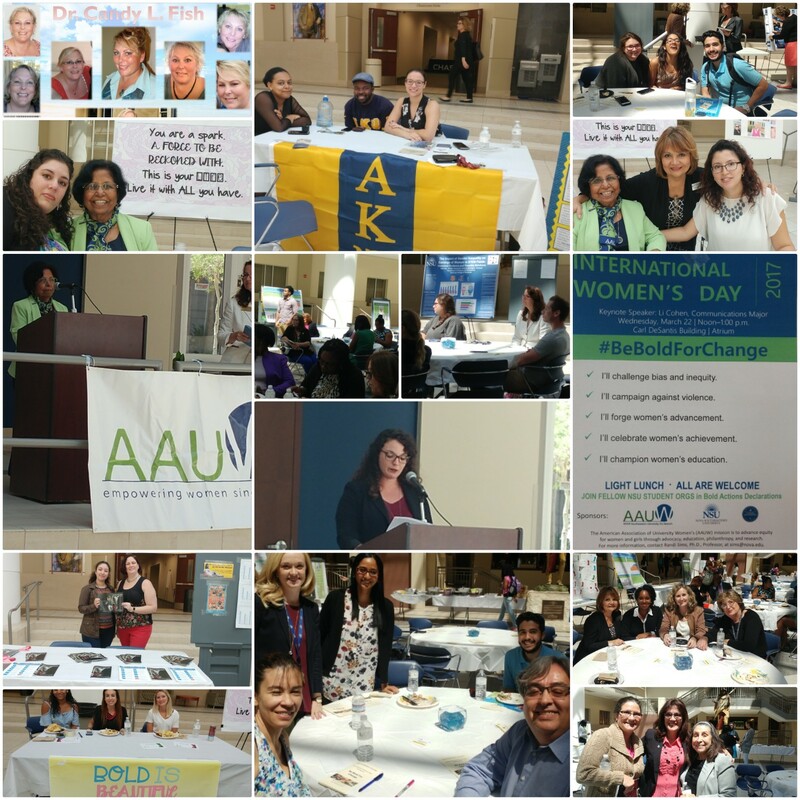 The NSU Branch of the American Association of University Women hosted an International Women’s Day Colloquium in the Carl DeSantis Atrium, Wednesday, March 22, 2017, noon to 1:00pm. The theme for 2017 was Be Bold For Change. Our Keynote speaker was Li Cohen, Communication Studies Major. Cohen presented Bold is Beautiful. Research posters on a variety of topics related to the theme were displayed by student groups from across the campus. This was an open event for the entire NSU community with over 70 attendees. A light lunch was provided. 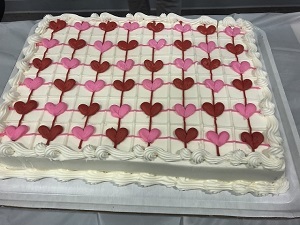 The Nova Southeastern Chapters of the American Association of University Women (AAUW) and Delta Kappa Omicron (DKO) have partnered with Barry University to support to 7th Annual College Brides Walk. The purpose of the walk is to raise awareness about issues of dating and domestic violence. The walk will take place Friday, February 17th, 2017 starting at Barry University and ending at Johnson & Wales. Check-in starts at 9am to 9:50am and the opening ceremony begins at 10am in the Broad Auditorium. Faculty, students, and volunteers will sign a waiver and receive wristbands for lunch at Johnson & Wales. Members of AAUW and DKO will meet outside of Broad Auditorium at 9:30am. If you are affiliated with NSU and would like to join the group in walking, please RSVP to dko@nova.edu by February 12th, 2017. Traditionally, walkers have worn bridal gowns; however, you may wear anything you feel comfortable in. Please wear an NSU shirt if you have it. See attached flyer for day of event details or go to the official website http://www.collegebrideswalk.com/. On the campus map, P3 is the commuter lot and the shuttle runs from there to Broad Auditorium where the opening ceremony will be (number 4 on the campus map). October 4, 2016 11:00 a.m.-1:30 p.m.
October 18, 2016 Noon-1:00 p.m.